The Spaniard is a narrow bar and restaurant, spread over three floors, in the heart of the now bustling Cathedral Quarter. Downstairs is like walking in to somebody's living room as there is ornaments and wallpaper everywhere! The only downside is that it tends to get very busy an Saturday nights. Across the road you can find 21 Social, The Cloth Ear and Ollie's. Have you got Google Earth on your computer? If so, then download the Google Earth view of The Spaniard. Is this the wrong position for The Spaniard? If you think so, then modify its position. Click / Tap the button above to get directions from where you are to The Spaniard. Twenty two pounds and twenty pence for a bottle of wine!!!!! For Gods sake; how to spoil an afternoon, a bog standard chardonay!!! My sister was going to treat us to a drink in the Merchant and I insisted it would probably be too dear!! Well I don't think it could have beaten that. We wanted to order tapas but were told they didnt serve food down stairs even though the two men beside us were tucking into a basket of chicken wings and the music was so loud. Because of the shape of the bar the four of us were forced to sit in a row and we just could barely hear what each other were saying. I was so disapointed as it was the first time two of the women had ever been out for a drink in Belfast. Never again! Just dont. Its really not worth it. Whats the deal with the bar staff here? Surly, aloof, haughty, chilly, disrespectful, remote, supercilious (ok i got the last one off google). There's no need for it. When the young lady finally realised she could ignore me no longer, i got a round of drinks flung at me and i let her keep the 2 quid change, (irony on my part) not even a smile! If ur into humiliation, go to the spaniard! I have never come across the lowest customer service in along time.staff/bouncers are extremely rude and brash.It is definitely not worth waiting in the long slow line to get in. nothing special and i'll be very happy to spend my money in more customer friendly establishments elsewhere. Went for a quiet drink with two friends one afternoon and tried this bar which was fairly empty at the time. The bar staff asked us for ID which we were happy to give (all aged 23) she then refused to serve us saying "its over 23's only - this is blatent lies as my younger brother (aged 18) drinks in here every weekend. Will NEVER be back and will be telling as many people about the lack of customer service in this bar. Shocking - especially at a time when most bars are glad of business!!! Very cramped. Not enough room to swing a cat in. after drinking in the spaniard for several hours afew months back, come 6 oclock, i was asked for id proving that I was over 25, as I was only 24 at the time the bar tender said she couldn't serve me as I was underage. After accepting my money for the previous 3 hours then asking me to leave,I think was an absolute disgrace! steer clear! decided to give this place ago again since i knew a uy who was going to be gigging there. The first time was no different from this time and the staff especially bouncers delighted us by chucking us out ( his excuse was that we were to drunk last time). Embarrassing. Never again. To be honest I had a feeling this would happen. If it wasnt for the singers the bar would disappear into the background. its plain and boring otherwise and a bit backward. Love the spaniard the best music in town without a doubt, sat dj is absolutely ace never have i heard a dodgy tune from him in the whole time we have been going there, brilliant.As for the staff dead friendly and upbeat. Shocked,Sober and Upset below is 100% correct in his/her judgement. We were also totally sober when asked to leave by the staff in here. We hadnt even had the audacity to ask for a music request? This happened during an evening out with some of my wife's work colleagues, and proved very embarrassing. But people understood the situation and we got no blame for the rudeness of the staff. It NOT just drunks and scruffs who get grief from the staff here. Those below who support this behaviour/policy, your turn will come. And I hope its in front of your friends or Boss! The reviews below all vary so i feel that people should be aware of the level of customer care that the staff subject patrons to. We all like the word consistent when it comes to good customer care but this takes it to a new level. For years we have have been going to The Spaniard on and off on a Saturday night. We asked for some music to be played by the DJ that wears the phoney glasses. He is advertised as being 'the legendary Ghost'. Legendary for his rudeness and bad language that is. We immediately felt the force of this guys temper and rudeness for asking for a request. At first i thought he was joking. He told us more or less to get out and that we were in the wrong bar. One of our friends overheard him calling us W______. When i asked him to repeat what he said he told me to F___ O__. When we complained to one of the guys behind the bar he took the dj's side, shrugged his shoulders and sniggered. We left the bar explaining why we were leaving to the door man. Again we were met more or less by the same response. We were out celebrating my friends 40th and our only crime was asking for some 80's records. In the past Eamon B always played our requests so please bring him back on a Saturday and get rid of Ghost. Awful person. There is no need to be rude and and call us W______. I can totally understand that some of the reviews are written by people who were perhaps drunk and bear a grudge but i was sober as i was driving. We have decided that we will not be back to The Spaniard for consistent bad customer care or having to feel the wrath of the person who plays the records upstairs. Sad but there are too many great places to socialise in Belfast. Just a quick coment on the toilets - i worked in the cathedral quarter for years and we had clean smelling toilets so forget about the tides as its nothing to do with it. The plumbing system in here is wrong and is not correctly sealed or is vented very close to the room that smells or maybe say w wash hand basin is not correctly trapped or something similar! Its simple you get what you pay for! Brilliant drink, great food, top music. I found the staff very friendly and informed. They've even managed to convert me to Rum. As I live in Scotland I don't get in as often as I would like but I've been in at night and during the day. During an evening visit I noticed the bar staff knocked back a couple. Fair play to the bar staff I thought, they're trying keep the right crowd. The couple did look out of place TBH. Slightly neddy. Bars can be so easily ruined by the wrong crowd and to me the Spaniard has got it just right. I have just been reading some of the reviews below and feel I must comment as the Spaniard is one of my favourite watering holes. I am a civil servant of 36 years service based in the city center and have been using the local hostilaries for all those years through good times and bad. 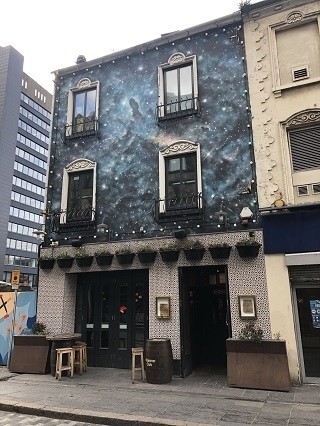 The Spaniard for me is almost like a locals bar in the city center, it is small, intimate, with a great range of unusal drinks, and very knowlegable and friendly barstaff. I have watched the city center change and develope and become more cosmopolitan, and sometimes think that not everyone understands that our city is changing, and not every bar suits every punter. So to you the Spaniards, hats off for doing a great job, it is always a pleasure to frequent your bar and may you continue with your exacting standards. That manager woman is the epitomy of rudness! Myself and my boyfriend were is this bar a few weeks ago, we had lunch and one drink each. The manager then came in and said to the bar staff that we sould not have been servedin the first place...because my boyfriends tattoo was showing! This was said well within earshot, I was so shocked at the manner in which we were treated! She made the bartender come over and tell us! Not his fault, but clearly she should have dealt with the matter herself! The offending tattoo was an artistic tribal tattoo, I don't understand what the issue was with that!? Needless to say I shant be back, and will tell as many people as possible to steer well clear of the Spaniard in future! I have always enjoyed the atmosphere in the bar until last night. Were the female bouncer wouldn't let us in as she said it was members only. After some discussion we explained that the rest of our party were in there and could we go in and get them and she wouldnt let us as we couldnt get them on the phone. Whilst waiting on them to come out were standing under the canopy as it was raining and she told us she was going to call the police because we were standing on their foot path... Never have I experienced such rudeness in the hospitality industry. Just spent a great night in this eclectic place..shabby chic at its most rock'n'roll, stuffed to the gills, and music to make a gal real thirsty, which is just fantastic considering the range of supberb drinks on offer! And not an alcopop or hoopla earring in sight...well done Spaniards, I'll certainly be back for more! Having recently moved to back to Belfast from London, I accessed this website for recommendations on where to drink i the city centre. The reviews for the Spaniard were so contradictory it piqued my interest and I had to visit. My personal experience of drinking in the Spaniard was fantastic..however that depends on what you are looking for. I have travelled widely and it was delightful to find that the Spaniard has only the 3rd recognised Rum Club in the world. The bar staff were educated in all aspects of alcohol, and I spent a wonderful evening drinking great concoctions handmade by the undeniably quirky staff. During the evening the staff did refuse to serve a few potential customers, and i can honestly say I would have done the same,not every bar suits every person, and surely this is the joy of choosing which bar you drink in. I want to be comfortable and relaxed, have attentive and knowledgable bar service, and it need not be starched shirts and chandeliers. So well done Spaniards, thankyou for great night out and I will be back regularily! As for toilet smell-from what i could find out, the Spaniard is built on reclaimed land composed mainly of sand and due to tidal shifts it sometimes really reaks! A problem that no-one can solve - so why not cut them some slack and appreciate all thats good. Good music/ambience, crowd are not too bad either, a good enough mix. Where this place falls down is STAFF. The blonde haired guy that does the door most nights is an arrogant little get, regular patron or not. Just loves telling you its a full house, then makes you stand there for a few seconds before letting you in before anyone comes out. Seems like a sad power trip to me. Take note, its not the hippodrome man. Really his arrogance does the place no favours at all. Oh and sort out the smell in the toilets downstairs too. Otherwise spot on. Love this bar! Staff are fab.. Great music and a nice crowd. Regulars are always treated well and door staff do an excellent job of keeping the riff raff out. Need to sort out the smell in the downstairs loo though! Went out with my father for a few drinks today, we decided to try the Spaniard. It was about 1.30pm,a Wednesday afternoon, it seemed reasonably busy (probably due to its small size). I asked the barman for a pint of Bud and pint of Guinness to be told there was no bud. I asked for another drink also which was not available. He then looked me up and down and said 'this obviously is not the bar for you' turned and walked away. We then decided our money would be better spent elsewhere. I think its a disgraceful attitude for barstaff to have, we will never be back and if you are thinking of going to this place... DONT. The Spaniard's a great wee bar that rewards its regulars well. You're always guaranteed a good natured crowd whether at lunchtime or in the evening, and you can be sure you'll hear some decent music played. It's not a bar to go out to be seen in or dance in, it's a bar to hang out with your mates. I love this place but it's very hit or miss. I have gone in during the day with no problem what so ever, but have been refused entry at night a few times, and yes I am 25. I don't dress like a scumbag, but I do have my nose pierced, is that a problem Spaniard staff?! All in all the atmosphere is great and so is the food. I just had the most revolting lunch at the Spaniard, which cost £18 for 4 tapas a glas of coke and a wine...dont do it! Aren't we being a bit unfair? When I moved to Belfast I discovered this bar pretty soon and thought it a godsend. Original, Belfast-chic (by which I mean effortless, understated, rough-round-the-edges chic). The music's always good and the girls who run it knew me by name after a couple of visits. They know how to do hospitality. The food is good for the price too. I can't stand being jostled so tend not to go there at weekends because it is small, but its atmosphere is great. As for the surrounding bars, the guy below was right about estate agent types liking them. They're like any big generic company chain bar you can think of, but worse, because the polyester suits who drink in them think they're smart places, so you're more likely to encounter that particularly grating "I drive a beemer" snobbery in them. I agree with the comments about the staff! i was there a few weeks ago and having a great night! As the place is so small, i was standing at the bar, as someone came behind me, i turned round and in the process knocked my drink over. You guessed it, i was turfed out, totally gutted at the complete lack of manners of the barman, who wasnt willing to listen to a thing i said. Ruined my night and i will never be back! This pub is so far up its own jacksy it isnt funny. I could write reams about the atrociuos staff but its all been said before but here comes the most ridiculous things you are ever likely to hear. I was refused entry on the basis that I was wearing sports gear. Having glanced down at myself and Im sure being 35 and all I hadnt left the house on a saturday night looking like a sportsman, I waited on the doormans punchline when I asked him what he was talking about. Here it is...........Do you not know who Fred Perry was? He was a tennis player, your wearing a tennis garment so you're not getting in. Whilst this craziness was talking place the DJ approached the door wearing the same polo shirt as I, only to be admitted and I got told that as he worked there he could wear what he liked. Safe to say I will never darken its door again and neither should you!!!! BEEN READING ALL YOUR COMMENTS SEEMED TO START WELL BUT BECOMING WORSE AS THE WEEKS AND YEARS GO ON. HAVENT BEEN YET BUT WILL BE CHECKING IT OUT SATURDAY NIGHT 24TH JAN. FULL REVIEW NEXT WEEK. Have to agree with most of the comments previous. This place has VERY unfriendly staff and management. You could be barred for sneezing. But if you are some sort of local "celeb" -you could wreck the place and be begged to return. A p***hole. Much better bars in the immediate area. Avoid this one. One of the few bars in the City that really do keep the trash out on the street where they belong. Lovely to have a drink in the company of an eclectic but basically decent crowd without having to worry about 'dissing' some scumbag by looking sideways. Went in a few months ago with my friends from work....we all work in another city center bar....and we were appalled by what we encountered. Having heard good reports on the place we expected a nice experience, what we got was an apparent refusal of the bar staff to serve anyone that they didnt recognise! After nearly half an hour we were served only to be confronted by the doorstaff and asked for our ages....we were all 22 or 23....and told that unless we were 25 we would have to leave. Being civil folk that we are we did this without making a scene, and agreed never to return. Thankfully we discovered the Garrick that night....a proper representation of Belfast hospitality. This is a small place and cannot afford to treat customers like this. Folks will move on to places they are made more welcome - and can have a bit of fun. Get a grip Spaniard - loosen up. The word is out about your bad attitude. Dont sell someone a few drinks then bar them for it. BEFORE they do anything. There are plenty better pubs in the immediate area. Places where punters can have a pint and be shown respect. TOILETS are STINKING Possibly the worst Hygiene in Belfast. An insult to customers and staff alike. Get a grip girls, a recession is on - clean it up and compete with a tight market. Just a theme pub in disguise. People think its indie/retro chic is charming but its owned by a chain and tries too hard at being cool. Sadly it's about the best Belfast has to offer these days but agree with others about the staff. Attitude problem!! P:S at the last comment about those who don't get the staff. There should be nothing to 'get'. They are there to serve drinks, not socialise. I have been a regular drinker in this bar for two years. Those that dont get the staff dont get it full stop. What would you be happy with? Think you might be better staying at home with a carry out. Bar atmosphere good, quite a crowd, but staff served food, kept tables cleared and offered drinks very well. Came to website to check if open tonight- sunday - for return visit. I agree, the woman manager can have a bit of a temper at times and it does make people feel a little uneasy. Having read through all the reviews on this bar most of them comment on the pleasantness of the staff, which i can't understand. I've have never encountered worse bar staff in my life in terms of manners - they act like they're doing customers a favour by serving them. Awful place. Wouldn't go back... went there for a friends leaving doo and were told on no uncertain terms that we had to leave due to the fact like we weren't 23(?? )(we're all 22). The snobby blonde lady stood looking at us until we left. Totally ruined our night. Excellent bar. Friendly staff and punters, great tunes, brilliant atmosphere. Bouncer was sound. Bar staff were snotty and the dj looked like Austin Powers, what more can i say. Overated converted house in an overated area. Love this bar, love the atmosphere, love the bar staff, love the music!! No wonder this little treasure was voted the best bar in belfast, much better than some of the other establishments around! Was in this bar a last saturday, the music was excellent. The two girls behind thebar were very friendly and helpful when i was deciding what to get. Keep up the good work!! Nice place, friendly staff, what more could you ask for. HAving used to work in the old Opium bar, this is much more accessable. Great crowd, and i mean crowd (it gets packed to the gills at the weekend), good sign for any bar. Nice atmosphere and unique design. Very rainbow friendly so no riff raff. Good night out. Average age late 20's. Brilliant Bar. Friendly Bar staff and great atmosphere. Superb music. Eammon is the best DJ about, never too busy to play a request for you.... Thats why im there nearly every week!! What is and was truly a lovely bar with ambience and good music is spoilt by the unbelievable rudeness of the bar staff - especially the blonde one. I wouldn't please these people by going back. I can't believe this place has such a good reputation in Belfast, it really is distinctly mediocre. The place is tiny, the decor is tacky and the food really is pretty bad. I couldn't recommend this place at all. I love this bar. The only problem is that it does get really crowded so you do need to get in early if you want a seat. The food is really good too and very reasonably priced. I loved this place. It was always my favourite pub in Belfast. It's just a shame than in the past 6 months a snooty blonde woman who looks down her nose at anyone who isn't part of the beautiful people got a job there. I'm afraid i just don't get this bar. It is kooky and nice for one visit, but not being able to stand still for a second without someone banging into you is ok if its a busy bar, but when it happens with 30 people in a bar its a bit much. Beer is cold, but choice disappointing and the smell of the toilets would kill you. Someone posted that if you were a snob then don't go, but i'm afraid that this bar is so highly thought of because of its location - in my opinion people are snobby who go there. Brilliant - genuinely the best bar in Belfast. It represents what the cathedral quarter night life is supposed to be about - fantastic atmosphere, original surroundings and great music. Puts other venues in this area to absolute shame - this is not for fans of the potthouse! I have now left Northern Ireland and I really really miss this place! Possibly Belfasts best kept secret! I cant speak highly enough about this bar. The staff, customers, atmosphere - all perfect! If you've got a snooty attitude, don't bother going. Has to be the friendliest place in Belfast. Great music and brilliant staff. Boogie where you stand and enjoy the craic. Don't worry about what you're wearing (label-wise). If you're that shallow, don't bother going here. Its down-to-earth, cramped, busy and a happy place to be in on a saturday night. Leave your ego at the door and enjoy. Best bar in belfast. Like coming home after a hard day.. The Spaniard has to be rated as one of the best bars in belfast, if not the whole of Ireland, and I should know, having drank in most of them! Warm friendly staff, especially the fella with the diamond earrings, great food- worth checking out the tapas menu, and a great atmosphere and good mix of people. A nice place to relax in the afternoon, or else to party the night away! Highly recommended, especially to hip cats. Estate agent types may prefer the Cloth Ear across the street. Keep up the great work amigos!!! Best bar in the world (and believe me I've been in plenty) Great atmosphere; great management and staff; great food; great, but unobtrusive, background music; cosy fireplace; great decor upstairs and downstairs (Jazz legends on the walls upstairs and a REALLY eclectic setting downstairs; great theme parties, boat trips etc. and a great crowd with great craic at the bar. A truly classy establishment. Oh, and you'll LOVE the goldfish! The Spaniard is the essence of Belfast wrapped up in chocolate! With an inviting ambience, the bar welcomes its customers with a special hospitality that makes you want to stay all night. A comforting selection of familiar music enables the easy interaction of regulars and first timers. I highly recommend. This has got to be the best bar in belfast, without a doubt! So chilled out, great staff, great selection of drinks, friendly, great music, great atmosphere, great character...fantastic! This is what great bars are all about. Congratulations to the owner/manager Janine, I love it!! Simply the best bar in a town full of them. Went there in October following a meal for a friends birthday and we all loved it, the music was great the bar staff were certainly busy but friendly and it was a lovely atmosphere. great bar, great kooky atmosphere and filled with chilled out staff and punters. only down side is it can get too busy and squashed - but that's what comes with being popular! I love it... Best spot in Belfast for whatever you want!! Staff are fantastic, atmosphere is second to none. Great wee place. It's cramped but fun downstairs. I've no idea about someones front room it would be a weird one. Ceiling and walls are covered with album covers and pictures/posters. Some very strange. I mean Harry Secombe and Dean Martin with Bob Marley - interesting combination. I've taken a look upstairs but haven't eaten there yet. Quirkey is a good description. I'll be back. Very friendly staff and great atmosphere. Can say that the cleintele are really friendly too. One of my favourite bars in the city center. Too packed on the weekends though or later in the evenings during the week. Never tried the food but heard its not great. Belfast should have more bars like this, cold beer great music and you just dont know who is going to walk through the door next! anything goes in this crazy little place! I have been to this charming and lively bar a couple of times now and really enjoyed it. The wine is great, and the pints good, the only problem is that it is too small, a little more space would be nice, but you can't have everything. Go to this pretentious bar if you fancy being verbally abused by the doorman. As a group of 4 females we were really shocked to have a jumped up little man in diamond earrings swear and shout at us at the end of the night for not getting out quick enough (one of us had nipped to the loo before leaving and we were standing waiting coats and bags at the ready). He even continued his tirade of abuse at us as we went down the stairs. Wonder would he have been so brave if we had been male and didnt have his gaggle of friends(allowed to drink after hours) to show off in front off? Much better places in the city centre to spend your hard earned cash. We are now hooked, can't wait to the weekend to get our weekly visit to The Spaniard, brilliant staff and fantastic atmosphere!! Living in the west coast of America, I thought I had experienced everything that a "Tapas Bar" had to offer. I was totally wrong. This is the ultimate cultural cocktail of "Belfast/Basque" style. The Spaniard is without doubt one of the special places I have ever frequented. Even though it is small in size, it delivers a big experience. The atmosphere is cozy like a local pub, the decor is a mixture of pop rock culture meets spanish chuxto, the customer service is five star from the immediate acknowledgement when you walk through the door to the gentle follow up during and after selected courses. I've been at 5 star hotels that offer less service. I loved the selection of light draft beers. The daily market specials (I had fresh haddock) were fresh, flavourable and value for money. My only regret is that I did not have additional time on my schedule to repeat the experience during my trip. I visisted with my girlfriend, and plan on having more friends stop by during their trips to Belfast. The Spaniard ROCKS! three tiny processed meat balls, under cooked calamari (which was advertised as salted chili squid)the chorizo was straight from a packet from tescos, and they played rap music in the back ground. It seemed very dis organised and really there was no atmosphere to even suggest that this was a spanish theme bar. Spent Paddy's Day in here - Great day !! Got in just before the masses of people found out about this little gem. Had wonderful lunch upstairs in the most relaxing of bars i've been in. Got great pints and great seats and just enjoyed it all day. I'll be there again during my next trip !! !